Joely Proudfit is director of the California Indian Culture and Sovereignty Center at California State University, San Marcos. For many universities, achieving true diversity on campus — not just meeting a quota of students of different races, but truly fostering an environment that feels like home for a large group of students — is a near impossible task. And as difficult as the task is when discussing African-American, Hispanic and Asian American populations, whose numbers in the general population are on the rise, when considering Native American students, the challenge is exponentially more difficult. At ­The Ohio State University (OSU), for example, there are 169 students who identify as Native American, out of more than 60,000 on campus overall. Shannon Gonzales-Miller, director of the Scholars Program within the Office of Diversity and Inclusion at OSU, says part of the attribution for such small numbers on campus may be because more and more students are identifying as being of “two or more races” on admissions forms. Because of complications with the way the “two or more” data is reported at OSU and the emphasis on alphabetical listings, if a student identities as African-American and Native American, the second classification would drop off of the report. Because of the number of races that appear alphabetically before “Native American” on a form, it becomes difficult to track students with Native lineage under this category, she says. But students, for the most part, are not just leaving the Native classification off of their forms in favor of another more prevalent racial background. But Gonzales-Miller knows the reporting does not fully account for the low numbers of students on campus. She says that in a place like Ohio (and the school gets a large majority of its students from within the state), it is difficult to find students with a defined tribal attachment. ­The Miami Indians of Ohio, for instance, were displaced early in the 19th century, and only those in Oklahoma remain as part of a federally recognized Miami Indian tribe. Gonzales-Miller says she has lobbied for initiatives that would, for example, allow those with tribal roots in Ohio to attend the university at an in-state rate. So, for example, Miami Indians living in Oklahoma would be able to enroll at OSU and pay the same tuition a student from Cleveland would pay. ­These initiatives have not yet taken hold, she says. Jacqueline Keeler, a writer and activist for indigenous rights and traditional Native values and a member of the board of directors for the Native American Alumni of Dartmouth (College), says there are things that can be done even in situations that seem as dire as those Gonzalez-Miller describes. For example, she says, Cleveland still has a heavy Native population due to an urban relocation effort undertaken by the U.S. government in the 1950s. And in other parts of Ohio where remnants of displaced communities remain, archaeological and historical efforts to bring Natives back to the community will likely be appreciated by some. “A strong commitment to helping those tribes to reconnect to their homelands would be a really great place to start,” Keeler says. In addition, measures like initiating exchange programs with universities that have large Native student populations would help to build a cultural presence on campus even before the university is able to attract students willing to make a four-year commitment. “­The United States — all of it is Indian country,” she says. For Gonzales-Miller, the line is not important. Both women agree that it is the ability to build a sense of community that is most critical for Native students. “Universities have to be really honest about what they can really offer students, but community can always be built,” says Proudfit. “What kind of support mechanisms are there, what kind of community engagement is there? For some students, if they’re not getting that at the institution, they go home a lot,” she says, which often leads to retention issues. 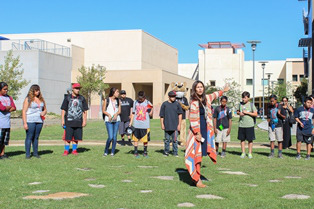 In San Diego County, where CSUSM is based, there are 25 different Indian tribes, she says, which makes the idea of place-based learning essential. For the last 10 years, the university’s president has had a Native Advisory Council, comprised of alumni, local tribal officials and others in the surrounding Native community. There has been an intentional effort to bring the tribal cultures onto campus — for example, when new buildings are erected, there is a tribal prayer to bless the land. This is a campus-wide tradition, not just something that exists within the sovereignty center or the diversity office. There has also been an intentional effort to hire faculty and staff who represent the surrounding tribes. The institutional buy-in to represent Native cultures is a top-down mandate, Proudfit says. “Our president [Dr. Karen S. Haynes] also has a stewardship of education to tribal sovereign nations. She recognizes their role,” Proudfit says. “Our campus is constantly out in the [Native] community, and so are our students,” Proudfit adds. But in places like Columbus, Ohio, which has a small surrounding Native community to begin with, forging that true sense of being an extension of the local Native community can be challenging. Urban Indians, she explains, are those who did not grow up on a reservation or a community with a large population of Native Americans, but who have had to forge a sense of identity in a predominantly non-Native environment. But even in these situations, Proudfit says it is important to take the steps necessary to build this community on campus. Whether by bringing in Native speakers or cultural programs, partnerships should be forged with local Urban Indian centers and the off-reservation tribal community. At CSUSM, that means integrating the American Indian Student Alliance; Native speakers, dancers and singers; and Native American filmmakers, directors, actors and tribal leaders into the total campus experience, for both Native and non-Native students. For the non-Native students, the experiences offer a lesson in differences, perhaps inspiring some compassion and an acknowledgement of the complexities of Native American culture. Keeler says the school needs to have a clear vision statement that includes Native students. Schools need “to be able to articulate what they want to do for Native students and the Native community and what they see their goal as being” as it relates to this population, she says. In Ohio, Gonzales-Miller says, bringing the sense of community into the whole campus environment is easier to say than to do. Citing multiple failed attempts to reach out to regional chiefs to build partnerships and a lack of institutional emphasis on Native student recruitment, specifically, she says that the few Native professors on campus are not enough to build a tight-knit community with a strong Native identity. But part of the sense of attachment and community could be just as simple as creating a designated workspace for the students to congregate together. A dedicated space in a building sends a message that the institution is serious about helping the students carve out something that belongs to them, Proudfit says. Keeler agrees, saying that, at Dartmouth, a Native student house where Natives live and hang out and a workspace and lounge where they can meet makes a huge difference. “The least this country can do — and these state institutions in particular — is to provide a safe place for students to meet,” she says. Also important, says Proudfit, is having funds dedicated to supporting these efforts. While a university showcases its priorities through its funding decisions, it cannot be a numbers game. Institutions cannot use enrollment numbers to build an argument for why Native program spending is not a priority, Proudfit says. Native students are not unlike other minority students on campus. Their traditions are different, but all want a sense of belonging, a sense of attachment and the feeling that the university is “wrapping their arms around them.” And, like with other groups, there is no surface-level way to achieve this; the only way to build a true sense of community is to build strong ties with the community.